Today, this rural South Shore community shares in a continuum of progress which has transformed the one-time home of a local Indian tribe into a charming residential community with schools, shopping areas, parks, transportation, fishing and boating. Norwell lies on Route 3, the major north-south artery connecting Boston the Plymouth and Cape Cod. It's also just eight miles from Route 128 and Interstate 93. This is the Town of Norwell named for Henry Norwell, a dry-goods merchant who provided funds for the maintenance of the town roads. Once known as South Scituate, Norwell's twenty-one square miles include many beautiful Colonial and Early American homes, authentic sea captains' house and historical residences. Since its founding in 1888, the town of Norwell has kept pace with the rapidly changing American scene. During the late 1880's Norwell had about 1600 residents, three churches, one bank, one library, one hotel, one doctor, five dressmakers, half a dozen general stores and provision houses, two undertakers, two coach lines and seven elementary schools. Transportation was by horse & buggy, or the "Old Colony" train to Boston by way of Hanover or Greenbush. Commuters were few, however, most men worked their farms. Many also worked in local shoe factories, box and trunk factories, a tack plant, a wood plane mill, a saw mill and supporting services such as blacksmithing. Women were "at home." 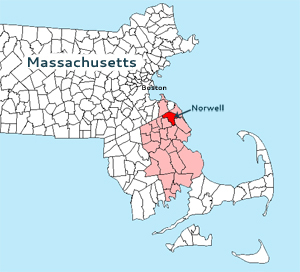 Today, Norwell is an affluent suburban town of approximately 10,000 residents many of whom earn their living in the city of Boston and surrounding communities. The farms and factories of a century ago have given way to private country homes, modern schools, shopping centers, churches, libraries, playing fields for baseball, football, soccer and lacrosse, health facilities, a wild life reservation, a medical center and other support services, as well as two large industrial parks. The historic area known as Norwell Center presents a quaint, old New England setting. And since further development is not allowed in this area, except by special permit, the very special ambience will remain. Preservation of Norwell's rural character is assured, in other ways too. Approximately 35 miles from Boston, Norwell is bordered by Hingham and Scituate to the north, and Marshfield to the east. Norwell's neighbors to the west and south include Rockland, Hanover and Pembroke. Route 3 makes Norwell an easy commute to the rich cultural, educational and historic attractions of Boston and Cambridge, as well as many high technology centers along Massachusetts' "Technology Highway," Route 128. With the scenic North River forming the town's southern boundary, Norwell is an ideal place for boat owners who want access to some of the top fishing/cruising waters on the Atlantic Coast. Fuel, chandleries and other marine services are available along the river, as well as quiet anchorages well protected from harsh sea winds. Ocean beaches and other picturesque New England harbors are only a few miles away. Norwell residents can also enjoy canoeing on the North River as well as the quiet serenity of a local wildlife reservation. The Albert E. Norris Reservation bordering the North River, provides miles of hiking and cross -country skiing trails, swimming, bicycling, areas for snowshoeing, and ponds for ice skating. Traditional activities such as Little League and youth soccer are popular too. During the year, The Norwell Recreation Office organizes a wide range of activities for residents of all ages. For children there's bowling, gymnastics, roller skating and more. Adults can participate in a wide range of activities from woodworking to money management. 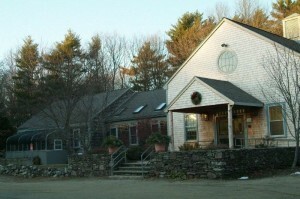 The South Shore Natural Science Center on Jacob's Lane offers a wide variety of youth and adult education courses, nature field trips, craft workshops and lectures. The center also includes a library, exhibits, six trails, some live animals and special events for children. The Company Theater is one of the few independently owned professional, regional theaters in the country. theater goers can choose form a variety of professional productions ranging from comedies, to musicals. The James Library Center for the Arts includes a small circulating library collection, local history, and has a concert program. North and South River Watershed Association: The NSRWA was created by a handful of river-lovers bound together by an intense devotion to the natural beauty of the area and a strong commitment to protect these natural resources for their own and future generations. The South Shore Medical Center in Norwell and the South Shore Hospital in nearby South Weymouth provide excellent health care facilities to area residents. There is a local newspaper, the Norwell Mariner which is published weekly. The Patriot Ledger and The Boston Globe are daily publications serving communities all along the South Shore. An open annual town meeting is held in the spring and residents are invited to participate. Elections are held during March. Special town meeting are called at the discretion of the selectmen or on petition of at least 200 voters. A three member Board of Selectmen meets weekly to execute the town's business. 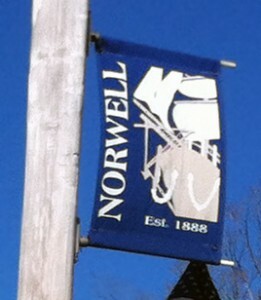 The town of Norwell has a superb school system run by the local school committee. there are two elementary schools, a middle school, and a high school facility complete with football and soccer playing fields, tennis courts and an auditorium. Norwell Public Schools reflect the intellectual strength and character of the community. Students are provided every opportunity to achieve their full scholastic potential. what's more, our students consistently score above state and national averages on SATs, and do well on MCAS; and over 80% of our high school seniors continue their education at colleges and universities from coast to coast. Originally part of Old Scituate, Norwell retains much of the natural beauty that greeted its first settlers in 1636. due to the rolling topography of the land and the abundance of unforgiving New England rock, the area offered little tillable land. As a result, early settlers were quick to take advantage of lush river marsh grass for cattle forage. It wasn't long before every inch of meadowland was deeded. Certainly one of the strongest influences in the economic progress of coastal New England during the 17th and 18th centuries was the ready availability of timber for shipbuilding and a naturally jagged geography which made for safe, secure harbors and handy inland waterways. This combination of raw materials in abundance and easy access to the sea formed the basis of many Yankee fortunes and set the stage for America's "Age of Sail." From 1645 to 1871, shipyards along the North River contributed iron muscle and seasoned timber to New England's growing shipbuilding industry. During that time, more than 1000 ships were launched from 15 different yards in Norwell, Pembroke, Hanover, Marshfield and Scituate. Many of these "North River" Ships, as they were known, sailed with the great whaling fleets out of Nantucket and New Bedford. After 1871, this colorful era lapsed and nature reclaimed the river once again. Situated on the easterly side of Route 3, Accord Pond Park has enjoyed substantial growth since its construction in the late 1960's. Today, the 122 acre site is home to more than 20 businesses which employ over 300 people. Across the highway from Accord Pond Park, the 150 acre Assinippi Industrial Park provides over 3000 feet of frontage along Route 3 with some 25 firms employing over 3000 people. Norwell's foresight in zoning these areas for commercial development has been successful in separating busy industrial centers from residential communities. And although land is still available for further business development, the essential small town character of Norwell has been preserved.